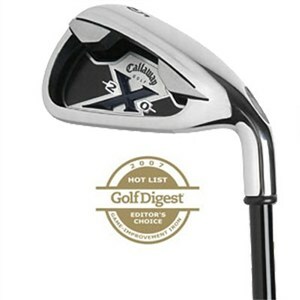 These X-20 irons are the predecessors to one of my favorite irons, the X22s. And the difference between the two is negotiable. The X22 was tweaked a bit to make it more appealing to better players -- a little thinner, and not quite as boxy. Both sets are designed with a high MOI and a forgiving cavity back that allows you to miss the center of the club and still get a favorable result. Both sets are a little offset to help higher handicappers close the clubface. And both sets look oversized at setup, which gives you confidence to make a good pass at the ball. When you boil it down, I would be hard pressed to recommend the more expensive X22s, especially to high handicappers. If you have a double digit handicap, get the X-20 with the graphite shaft -- and thank me later. For better players, I'd steer you away from any of the X series and point you towards some Titlists or Nikes. Two sets that I really like are the Titleist AP-2 and the Nike Victory Red Forged Split Cavity Irons.